Authored by shubham on Oct 6 2018, 6:08 AM. 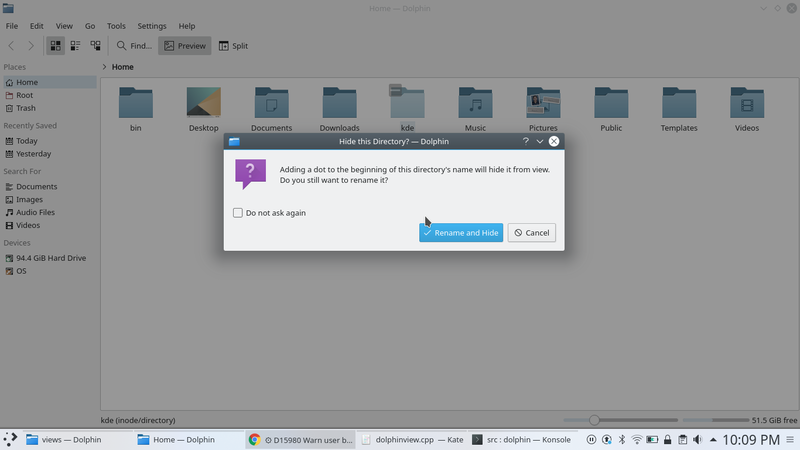 For normal "casual" linux users, renaming the file/folder starting with dot may get irritating, they will be wondering their file is deleted. Now that we're using a KMessageBox::questionYesNo, the "No" choice is now just the word "No", which we should avoid. Instead, the button's text should be "Cancel", and it should have the appropriate cancel icon. You can use a KStandardGuiItem::cancel() for this. 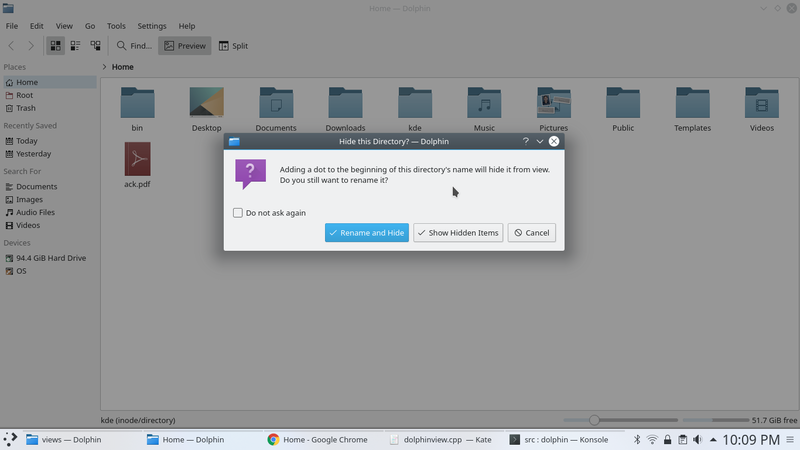 I had another idea: instead of telling the user how to show hidden files inside the now somewhat crowded dialog box, we could show it as an inline message using dolphinViewContainer::showMessage(). Bonus points if you add Undo and/or Show Hidden Files button to the widget! @pino, looks good to me now with the latest version of this diff. which is the parent widget in this case? "Show Hidden Files" button would be redundant because the inline message would have communicated that piece of information already. Bonus points if you add Undo and/or Show Hidden Files button to the widget! "undo " button? The user can cancel it. My idea was that the "Show Hidden Files" button would be on an inline KMessageWidget that shows up after you do "rename and hide". It doesn't make any sense to put it in the dialog. Ok. What should I name that inline message, because that inline message would be guiding the user how to unhide files/folders, which don t make sense as the message will be having "show Hidden Files" button. "Undo" button won't be suited here , if the user had really wanted to not hide, they would have choosen "Cancel"
This comment was removed by shubham. If that's how human behavior worked, there would be no need for "undo" functionality at all. :) The concept of "Undo" is premised on the idea that sometimes people who are moving quickly make a mistake that they only understand moments after doing it. That's when an Undo is useful. So you want both undo and show hidden items button. The "Undo" would just be deleting the first character(.) from the newName to unhide it. And "Show Hidden Items" button would be just setting setHiddenFilesShow() to true. Can you help me out how to add those two butons to KMessageWidget? Also the DolphinViewContainer constructor asks for parent widget. Which is its parent widget here? In a third patch, use that new function to add a message saying, "$file is now hidden. Undo Show/Hide Hidden Files"
@ngraham makes sense to me. Will submit those subsequent patches later. Thanks! One more thing: let's use "folder" instead of "directory" for the user-facing strings. Also please mark the inline comments that are fixed. shubham marked an inline comment as done. This now looks good to me in terms of both code, functionality, and presentation. Make sure all other reviewers have changed their statuses to "Accepted" before landing. Thanks again for the patch! Make sure all other reviewers have changed their statuses to "Accepted" before landing. @pino @elvisangelaccio what's your say on this now? @pino @elvisangelaccio are there any comments from you side? If not, I will be landing this revison. questionYesNo returns a ButtonCode, not an int. (or we can just use const auto code = ...). shubham marked 5 inline comments as done. shubham retitled this revision from Warn user before renaming the file/directory to start with a ' . ' to Warn user before renaming the file/folder to start with a ' . '. Made above requested changes by Elvis. Please use a more descriptive key string. It should be in CamelCase, for example "ConfirmHide" or similar. Also, please remove the leading :. That will put the config key in kdeglobals, but this is a Dolphin-specific dialog and the config key should go in dolphinrc instead. This argument can be removed, it's already used as default. shubham marked 2 inline comments as done. @elvisangelaccio Is it good to go now? Works and looks good to me! @pino @elvisangelaccio Can you give green flags from your side? This is not a user-visible string, so it shouldn't be translated. Just use QStringLiteral("ConfirmHide"). xi18nc("@info", "Adding a dot to the beginning of this file's name will hide it from view.<nl/>"
Do you have commit access? @elvisangelaccio Yes, I have commit access, but what about @pino 's review? The prompt "Do you still want to rename it" feels unnatural/unusual. "Continue?" or "Do you wish to continue?" or something similar might work better. Just a suggestion, I do not have a strong opinion on the matter. I think it's okay as-is. It's good to re-state what will happen in case people didn't read it the first time. The patch didn't land, probably because you tried to push it to non-existant arcpatch-D15980 branch. D20427 When renaming files, move to next file using tab key.